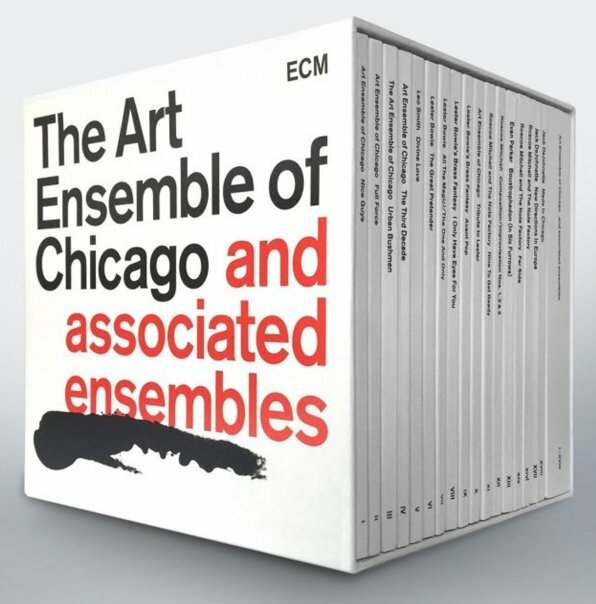 A huge chapter of work from the Art Ensemble Of Chicago – one that not only includes their own albums for the ECM label, but also related solo and side projects too! The set begins with four Art Ensemble albums – Nice Guys, Full Force, Urban Bushman, and The Third Decade – all of which came out as a statement of the group's strengths in the late 70s and early 80s – their first mainstream appearance after a few years of being very underground, and material that helped set a whole new standard for avant jazz expression in the generation to come! Next is the fantastic album Divine Love, by trumpeter Wadada Leo Smith – not necessarily an Art Ensemble album, but one that does feature great work from trumpeter Leo Smith – plus trumpeter Kenny Wheeler, bassist Charlie Haden, and vibist Bobby Naughton. Next are four albums by Lester Bowie – two smaller group, and two with his Brass Fantasy ensemble – the records The Great Pretender, All The Magic/The One & Only, I Only Have Eyes For You, and Avant Pop. Then, after Bowie's early passing, the Art Ensemble recorded their beautiful Tribute To Lester – as a trio lineup with Roscoe Mitchell, Malachi Favors, and Don Moye. Mitchell takes the helm next – on a surprisingly big flurry of projects for ECM – records that often show a deeper compositional strand in his music – on records that include Nine To Get Ready, Composition/Improvisation, Far Side, Bells For The South Side, and Boustrophedon – the last of which was led by Evan Parker, with Mitchell in the Transatlantic Art Ensemble. Last up are three records by drummer Jack DeJohnette for ECM – New Directions and New Directions In Europe, both featuring a group with Lester Bowie on trumpet – and Made In Chicago, which features Roscoe Mitchell, Henry Threadgill, and Muhal Ricard Abrams. Recordings were made between 1978 and 2015 – and comes in a box set with a big booklet of notes! © 1996-2019, Dusty Groove, Inc.